Visions of Jesus Christ.com - Maria Natalia Magdolna - Stigmatist. Above photos are of Maria Natalia Magdolna. Right photo is Maria with visible stigmata. Images and story found [here]. Read/view magazine about Maria Natalia Magdolna [here], and [here]. Following history roughly translated from Spanish from [here]. There really happened prodigious facts, barely known, but that they will try to recover at least some, it would be impossible to redo the whole story of the most important events in Ladeira. I do not intend to write the history of Ladeira, even a complete summary. I simply want to highlight some significant events (in my opinion), and especially to have my experiences and the testimony of the most important (not get to remember everything) I witnessed, felt and lived in Ladeira. The person who starred in these events was called Maria Conceicao. It all began in October 1959 when Maria Conceicao, an uneducated and poor peasant, was hospitalized, seriously ill, in the hospital of Mercy in Golega. She was entering the hospital chapel and asked to the image of "Nosso Mr. dos Passos" (Jesus with the Cross) to give her proof that He existed and that would cure. And so, the first Sunday of April 1960 saw the image of Jesus shook his head nodding and opened and closed his eyes. The fact was repeated several times and even her own mother, in one of her visits, she also saw the picture nodded, eyes twinkling. Shortly afterwards, she was healed and was discharged. Since then and now residing in Ladeira started having "visions" in Heaven. As of June 17 began to see Jesus bearing his Cross and a star forward. This "vision" remained in the eyes of Maria Concepcion and persons accompanying her until 1962. The February 18, 1962 the Blessed Virgin appeared to her first. Maria Concepcion was praying with some people at the door of her house. The Blessed Virgin came in a very white cloud with a pink glow with rays of light that seemed golden threads. The cloud settled on the roof, resembling a ball of fire, that all present saw, being alarmed at the thought that the house was on fire. The cloud opened and she left the Blessed Virgin, dressed in white, with a blue robe and a crown of stars. From that date, the Blessed Virgin kept appearing, quite often, several times a month. On May 7 appeared Archangel San Miguel. Thereafter his presence was lavishing ever more, to the point of seeing him every day. When Maria Concepción account all these facts the pastor of Torres Novas, this bitterly opposed, without studying the case, nor show any interest, clearly neglecting his pastoral duty. Even on a clear abuse of authority, denied the sacraments ... However, the Archangel Michael keeps sending you to go to Torres Novas to confession and receive Holy Communion, which were systematically denied. 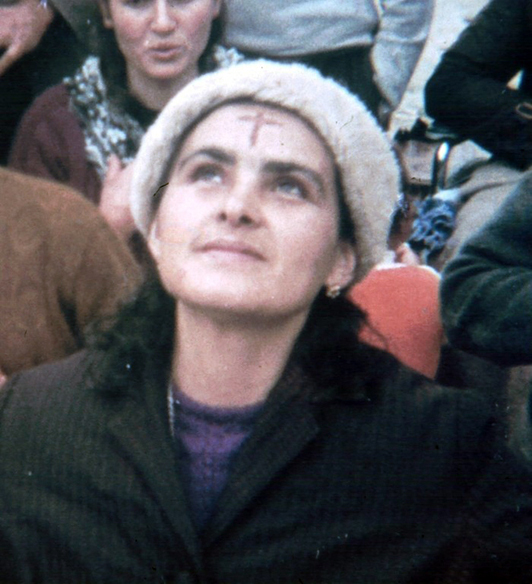 The February 15, 1963, Friday after being denied Communion in the Church of Mercy of Torres Novas, Maria Concepcion went home crying and soaked by rain. Then appeared the Archangel Michael and gave him Holy Communion for the first time. From that day until December 8, 1965, San Miguel gave Communion every day, hundreds still the case in which the Sacred became visible when the San Miguel deposited on her tongue. There are many testimonies and graphic documents. This was studied by different doctors and the Judiciary Police, who watched the "phenomenon", not find an explanation. Between 1963 and 1964, Maria Concepcion was the subject of three brutal attacks .. The most violent of the three took place on April 3, 1964, when it entered his house 5 women and a man beat her, threw her to the ground, broke her teeth,shaved badly and left lying on the floor, unconscious and bruised body. Apparently, so was learned later, were people who frequented the church, the church of Father Vitorino (miura proper name), who is denied the sacraments and who publicly slapped in the church coming to communion. But they did not follow suit. They also tried to burn her alive, igniting the dress she was wearing, which caught fire as she led the prayer. Fortunately, other people her aid and extinguished the fire. Talk of persecution Ladeira is endless and really, "Amazing", inconceivable, therefore, the small book I wrote I titled: "Ladeira of persecution, thorns and suffering." Indeed, in the trial of Maria Concepcion, conducted in 1973 and in which was demonstrated that the Patriarchate of Portugal "bribed" to a person, to testify falsely against Maria Concepcion, his Basque lawyer da Gama Fernandes, said that had not existed throughout history, no religious persecution as excessive and brutal, after the witches of Salem, as carried out against Maria conception. This gentleman, Fernandes Vasco da Gama was a few months after the first President of the Congress of Deputies in Portugal. On December 8, 1965 Maria received Communion conception given by San Miguel, but unlike other times, kept the Host on your tongue for 40 days, always surrounded by people that attended. In these 40 days, Maria was fed only conception of the Holy Eucharist. San Miguel each morning brought her Holy Communion. During this time Maria Concepcion had numerous ecstasy and even began to live "the Passion of the Lord." Had much suffering and many trials, especially hunger and thirst. "I'm so hungry, dear Jesus, and there are still so many days!" Heard him exclaim in the early days. I talked to several witnesses of this extraordinary event and all confirmed me that Maria Concepcion was never alone, that those who accompanied her were continually watched and pray, that Maria Concepción and prayed with them all this time did not prove not a drop of water, or any food, other than the Holy Eucharist. On January 17 ended this important miraculous, unique in history: keep sacred way for 40 days in the mouth without suffering any alteration. Something unusual and quite extraordinary. This period of "Miracle of 40 days" semejó Jesus fasting in the desert and was preparing for the "public mission" of Maria Concepcion. This had its effect and the reaction of the Portuguese authorities, the initiative of the Religious Authorities, he was to place her in the Psychiatric Hospital Julio Matos Lisbon, to keep her under observation. There he arrived on 12 March. The first thing they did was remove all her clothes, purse and belongings. When someone came to visit, they also monitored her that she was not to carry razors (to be stigmata) or "forms" (wafers) to pretend visible ecstatic communions or any other "suspicious" object. Visible communions, stigmatization, rapture living the Passion: But these extraordinary events there were repeated. First appeared in the hands stigmata, feet and side. The stigmata appeared on both hands and both feet. Also formed a cross on her chest ... I have a thorough and detailed everything that happened between March 25 and May 16 in the hospital story. I'm writing this is obviously only a brief reference. Doctors and nurses, including hospital chaplain, could contemplate these phenomena, without any medical or scientific explanation. I have the names of doctors and chaplain in the story to which I referred earlier. After two and a half months of observation, found nothing abnormal or fraudulent and had to discharge. But none of this convinced the Patriarchate of Lisbon, which always rejected everything that was positive and went to lies, slander and persecution. So as it sounds. On his return to Ladeira, Maria Concepcion started having ecstasy through which, the Lord and the Blessed Virgin manifested talking on her mouth. Some priests called gift of prophecy or "prophetic ecstasy." More and more people flocked Ladeira and became a "Local Oração" a place of prayer. On June 9, Feast of Corpus Christi, appeared stigma of the Cross on the forehead. This stigma was not permanent. It appeared like a wound, like a cross-shaped wound. Then, slowly, he was disappearing to stay "near" normal front. This was repeated quite frequently for several years. I have personally witnessed this on several occasions, from beginning to end. I will tell later. As of August 15, the same year 1966, they started going to Ladeira guards GNR (National Republican Guard), also at the request of the Patriarchate of Lisbon, to prevent prayer was made ​​there. They came mainly on Saturdays and Sundays, dates greater influx of pilgrims. This presence and persecution of the GNR was perpetuated until May 1974, reaching extreme limits in August 1972, as I will tell later. But none of this managed to end the prayer nor Ladeira Mission, despite the best efforts of the Patriarchate of Lisbon. In early November 1968 there was a singular fact. Maria Concepcion then had very short hair. A Ladeira had come a priest, given the persecution Ladeira was obviously maligned and discredited. In an ecstasy, Maria Concepción a lock of her hair and pulled The Lord said that would signal with that hair, to prove the authenticity and sanctity of this priest. Maria Concepcion kept this small tuft of hair in a locket around her neck. A few days later, her hair had multiplied and the locket was opened to increase the volume of hair. Put then in a shoebox. There he continued to grow and multiply to also get out of the box. Some pilgrims carried Queluz Ladeira a large glass case. There's hair continued to grow and multiply up to the length of the casket. There is still preserved, after more than forty years. How many times I contemplated my first trips, always exuded a pleasing fragrance. And I saw that was the same height as Maria Concepcion. The September 25, 1969 Jesus said in ecstasy: "Soon I will do a similar to the Wedding at Cana miracle." Two days later, following the indications given by our Lord in an ecstasy of María Concepción, put ten liters of water in a container with capacity for 25 liters. And with eight witnesses, they closed and lacraron, after checking that there was only water. On October 1, the container was opened, before the same witnesses, checking that there was no water, but 15 liters of oil. This oil was proved to be analyzed and a new oil of the highest quality, despite not working time at the wineries. This oil was also increasing in volume to total container capacity 25 liters. This has been repeated countless times. We all wanted to have a little of this oil. And so we had flasks, bottles and even large bottles, María Concepción to give us a little of this oil. One of the most striking events occurred on December 30, 1971. There were many jars and bottles for Maria Concepcion give us oil. With a pitcher, Maria Concepcion was taking quarts of oil to fill generously our packaging. At the end, after removing eight or ten liters continued container filled with oil, as if he had not taken a drop. All present, Portuguese, Spanish and French, as we saw with amazement. It was normal to lower the level and then recover by itself. I slept one night by the oil container. I found that I was halfway, more or less, but a few hours, no one had entered the room, the container was completely full to overflowing, with a beautiful golden color and a fresh smell of oil. Something similar happened to many people with their oil Ladeira: they gave to other people and then returned to have the same amount as before. With this oil many extraordinary events occurred, especially healings. Just tell what happened to a priest, then residing in San Sebastián. This priest had the vice of snuff, could not go an hour without smoking. One day I was in the confessional and she met a French lady who was returning from Ladeira. This person called and Armande was a great apostle of Ladeira. Armande spoke to Father J. Ladeira, the wonders that occurred there. He spoke of the oil and told him that carried a full bottle. The priest, with skepticism, said, "If I lose miraculous smoking habit." He dipped his fingers with oil and made ​​a cross on the tongue. After a while, lit a cigarette and had to pull because "they knew evil." "Well, I still have the taste of the oil on the tongue. Already pass." Nope, not happened. He tried several times and always felt bad. Thereafter he quit smoking. Later Ladeira visited and became one of the great defenders Ladeira. As I said at the beginning of this page: I do not intend to write the history of Ladeira, even a complete summary. I simply want to highlight some significant events (in my opinion) and, especially , to tell my experiences and the testimony of the most important (not get to remember everything) I witnessed, felt and lived in Ladeira. And those experiences, the best of my life, I have always defended and will defend it as something supernatural celestial, occurred between 1970 and 1974. There were more important facts that I witnessed and participate. His Masses were beautiful with chants, incense and maintaining the same liturgy that St. John Chrysostom wrote in the early centuries of Christianity, when there was only one Church. But the death of D. Gabriel I of Portugal (18 Feb 1997) came a time that I, personally, I call "decomposition". 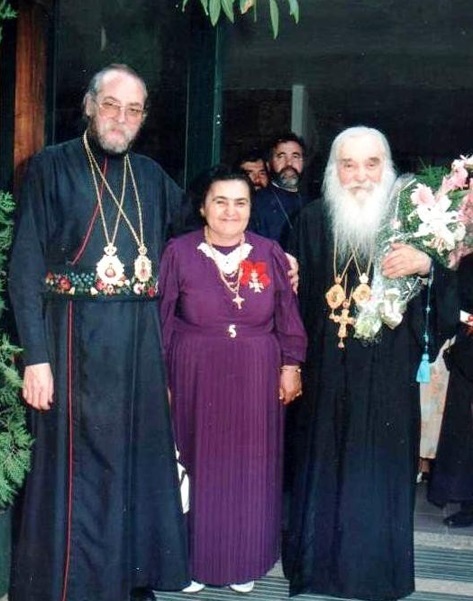 His successor distanced Maria Concepcion, while still maintaining Ladeira which the entire fabric of the Orthodox Church ... It had been announced that Satan, the great divider (the divider), Ladeira try to destroy from within, because I had not gotten from outside. Emerged infighting and Maria Concepcion were left with a very small group of priests. All this suffering was great. When I went to Ladeira saw a human work, but did not recognize the Ladeira before, my Ladeira. August 10 was the home of my wife's family in Portugal, watching TV. The telejornal night (say the news) started with this story: "She died a saint Ladeira." Shouting I called my wife, who saw the news stunned. We were in awe. The next day we turned in Ladeira. The cathedral was packed. One by one we were going to bid farewell to Maria Concepcion. Most people cried. I have returned to Ladeira several times after the death of Maria Concepcion and me came to mind the words of the poem of the Cid: "God had it good vassal good sir!" So much war, so much persecution, so many lies, so much rage, so much injustice against this peasant ...! As I said in my lectures on Ladeira: "My intention is not to prove or convince, but simply to be faithful to the truth and give the testimony of what I saw, felt and lived in Ladeira." For complete story visit [here].